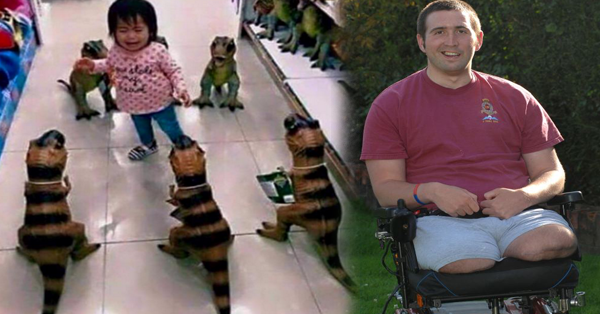 This Might Be Very Rude But The Story Behind it Could Make You Smile... MAYBE? Most of the time, children always wanted to stroll inside of any establishment whenever they were brought by their parents. Sometimes, they are too explorer to find and see things that are new in their eyes. When the child sees that mom or dad gets busy with their grocery list, they would definitely find ways to escape their side and explore the surroundings until they will notice that they are loose, then except for the crying baby. But of course, there is someone who will act as a hero. They will help to find the parents of the child or they will ask somebody from the authority to help. This happened to the kid in this picture. A physically challenged man tries to find the parents of the child in one big grocery store. He saw the child crying and shouting for her mom’s name. Because he only carries himself, he couldn’t carry this kid. 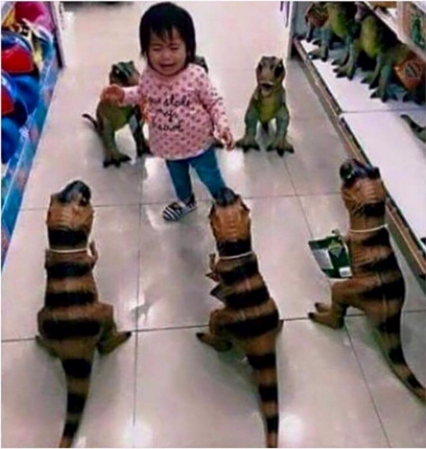 So, what he did is he put dinosaur toys around the kid to trap her so she won’t step out of that place. Then, he went to the customer service counter to ask for help. The parents found their kid and gave so much praise to that man. Everyone in the store finds it funny, but very impressive.